Fitness: No gym? No problem. Don’t have a gym membership? No problem! Get creative at home! I struggle with the idea of getting a gym membership because I am a working momma. I feel guilty taking my kiddos with me to the gym to only be away from them for even longer. They are in school or daycare all day, so I try to spend time with them in the evenings, but I don’t want to sacrifice my workout time either. So, I have came up with some creative ways to workout at home and have fun! Use your furniture: Chairs are great for working out. I use one of our dining room chairs for tricep dips, split leg squats, (watch video) step ups and more. Use your kiddos as weights: If you can’t beat them join them. My girls are constantly running around me while working out. So I use them as weights. They think it’s the best thing in the world to hop on my back while I do squats. They are having fun, while you are working hard. Believe me, momma, your legs will be sore after this one! Remember to pick out some great tunes to get you movin’. Click here to see our favorite songs to get you moving. See, working out can be fun. And best of all you get to spend time at home and instill good habits in your kiddos! Wifey shirt purchased from Wear it’s AT designs. Click here to see more fun shirts. Working out is hard enough as it is. The music you listen to could play a big role in your motivation. For me, it plays a HUGE factor in the intensity of my workout. Music is a powerful tool. Are you stuck and don’t know what to listen to while you work out? Here is a sample of a few songs from my play list that get me moving (my current favorite are the first two)! The key is to have fun with anything you do and it will never feel like work! Kelli’s work it out play list! Finding the time to get to the gym can sometimes be a challenge, not to mention expensive. Just thinking about it can be exhausting! What works best for me, is to workout at home and involve my girls! I would suggest finding a fitness app or follow fitness tips on Pinterest or Facebook. Some of my favorites on Facebook are Megan Ewoldsen and Healthy Emma. They both post quick workouts you can do at home. Put your workout clothes on the minute you get home. If you sit down to rest you will never get off the couch! Most days, I put on my workout clothes the minute I get home. Just changing clothes is half the battle! Turn on some upbeat music. Music will get you moving! Involve your kiddos. My girls love to workout with me. Plus, what a great example you are setting by teaching them how to be healthy! We usually end up having a dance party when it’s all over! Warm up. I like to run up and down my stairs at least 10-15 times. If you don’t have stairs, jog in place, take a brisk walk or jog outside with the kids, jump rope or do jumping jacks. Target a specific area each day. For example, Monday: legs, Tuesday: abs, Wednesday: arms Thursday: rest day and Friday: cardio. You can combine some of the days as well. Try to only take two days off per week. Multi-task. During breaks and between reps get dinner started or start a load of laundry. Cool down with yoga and/or stretching. 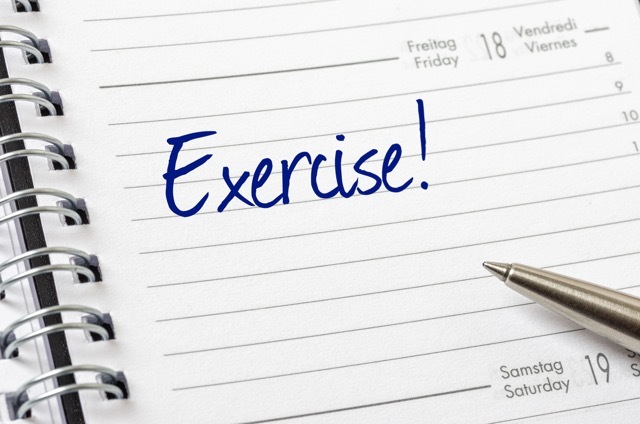 If you find the right routine for you and your family, you can easily stay fit and healthy without leaving the house. Have a fun workout you do with your family? Comment above. We would love to hear from you! So you’re starting to run. If you’re like most moms, you’re definitely wondering how you can possibly find the time time to run when you have two (or three, or more) kids, work full-time, and have the kids’ activities to juggle. Or maybe you’re home with the kids, but you’re home with the kids, so when will you find time to run? Anytime you make a new commitment, it can be challenging to find the time for it in an already over-committed and busy calendar. But the saying is true: if it is important to you, you will find the time. Schedule it: Adding your training to your calendar will help you find the time for it, it will block the time off so you don’t commit to something else, it will create structure and consistency, and you will be more likely to follow-through with it. Ask for support: Share your new interest in running with your family and ask for their help. Maybe your spouse can help with the kids so you can enjoy a run. Get out there early: You are less likely to skip your run when other things come up during the day if you do it first thing in the morning. Plus you get to enjoy the post-run feeling throughout the day and you start your day on a healthy and positive note. Join a gym: Many gyms provide childcare and they all have treadmills, so that allows you to work out while your kids are being cared for. Some gyms are located near running trails where you can run outside while your kids are being watched. 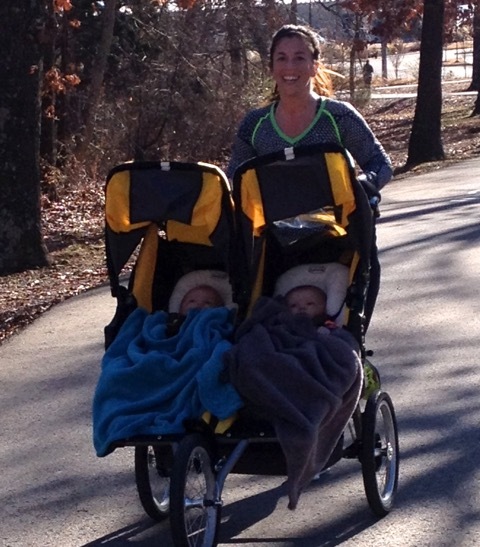 Invest in a jogging stroller: If you have a jogging stroller, you can load the kid(s) up and take them with you! It will give you a total body workout and make you an even stronger runner. It is also a great way to share your love of running with your children and involve them in a way that is fun for them. Jogging strollers can be expensive, but you can find a used one at a consignment shop or online. Find another parent to swap kids with: If you have a friend or neighbor who is in the same situation as you, set up a system where you watch the kids while she runs and then she watches the kids while you run. Aside from finding the time to run, another common hurdle is staying motivated. It can be hard to pull yourself out of a warm bed to run or you may just not feel like running on some days. Don’t worry, everyone has those feelings! Make goals: Whether they’re big or small, having goals gives you something to work toward. Sign up for a race: By registering for a race, you have a ‘deadline’ for when you need to be ready to go. Record your runs: You can record your training in a journal or online, but being able to review the progress you’ve made will help you to see your hard work paying off and you’ll want to maintain that. Get dressed: It may sound silly, but sometimes just getting dressed and putting your running clothes on will help you get out the door. Find a friend/group to run with: Running with others can be fun, but it can also keep you accountable. If you know others are waiting for you, you won’t want to let them down. About Beth: Beth is mom, runner, running coach, and the blogger behind RUNNING around my kitchen. She and her husband adopted two boys who are a month apart and just celebrated their first birthday. Beth serves on the board for the Hogeye Marathon and is interested in helping other moms with their training and answering any questions you have. You may be asking Why. Why should I start running? What does everyone love about it? And isn’t it bad for your knees? ◊ Clear your head and relieve stress – Whether work is busy, you are going through a tough time, or you have a problem to sort out, going for a run is a great way to clear your head. ◊ Gain energy – You’ll feel more energetic and reap the rewards of endorphins. ◊ Give yourself “me” time – By taking care of yourself and giving yourself time do something that is enjoyable, you will be a better mom and better able to take care of those who need you. ◊ Achieve goals – Running provides endless opportunities to set goals, work towards them, achieve them, and then continuously repeat that cycle. This fosters feelings of pride and accomplishment and improves your self-esteem. ◊ Set a good example – As a mom, you know your kids are observing you and learning from you. As a runner, you are a great role model for your kids – you are active, taking care of your health, following through with a commitment, and trying new things. ◊ Meet new people – Runners are fun people and they like to be social! ◊ Get fitted for shoes – This is my biggest piece of advice! Don’t buy the shoes your sister loves, don’t use the old tennis shoes in your closet, don’t buy the prettiest shoes, and don’t go to a big-box outdoor store. Go to a specialty running store, be prepared to spend around $100, and get fitted for the right shoes for you. Not having the right shoes is a leading cause of injury and, if you are injured, you won’t be able to run. ◊ Don’t worry about pace or mileage – As a beginner, it is easy to compare yourself to others. Everyone was a beginner at one point and the important thing is you are out there. You may want to start by tracking your runs by time and not pay attention to how far or how fast you run. ◊ Start with a run/walk rotation – You can condition your body and learn to run further by setting up a run-walk-run rotation. Perhaps start by running 4 minutes and walking 1 minute and adjust the time you do each as your body adapts to running. ◊ Don’t do too much too soon – It can be exciting to start something new; however doing too much too soon can lead to injury. Start with shorter distances, don’t run on consecutive days, and slowly increase your mileage. ◊ Follow a plan – Beginner training plans are readily available online or find a group of runners in town. About Beth: Beth is a stay-at-home mom, marathon runner, and the blogger behind RUNNING around my kitchen. She is a certified running coach through the Road Runners Club of America and offers personalized online coaching services for runners of all levels of experience. She and her husband adopted two boys who are a month apart and just celebrated their first birthday. Beth’s next run will be the Hogeye Marathon on March 29th.